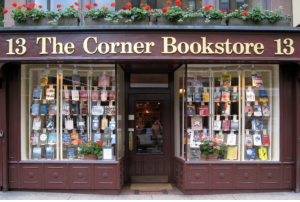 The Corner Bookstore at 93rd and Madison Avenue, New York City, confirmed today an event for The Suffragents: How Women Used Men to Get the Vote at 6pm on Monday, September 11. This is especially meaningful and not just because of the coincidence of that day’s solemn anniversary. The store really is on my corner, just one short block west, and I’ve been shopping and browsing there for more than three decades. More than that, back in 1990, the store’s knowledgeable staff conducted the out-of-print book search for my daughter, Brett Kroeger, for one of her middle school projects. Remember, out-of-print book searches in those proto-digital days were not the work of a few keystrokes. They took effort. They had to be done by snail mail, by placing ads in print publications like the Antique Trader. At the time, I only knew about the Mignon Rittenhouse biography, the very book that sparked my life-long fascination with Bly. Yet the search also yielded a second juvenile biography of Bly by Nina Brown Baker, also from the 1950s and just as long forgotten as Bly herself at the time. Brett made a point of how much the two biographies differed in their presentation of facts (The longer version of this story appears in the Introduction to the 1994 Nellie Bly: Daredevil, Reporter, Feminist). The bookstore’s search and Brett’s insight turned out to be my starting point for book writing. Sweet.